Contemporary art, interdisciplinary research communities, and traditional Appalachian culture converge in Rural Avant-Garde: The Mountain Lake Experience, an exhibition showcasing the collaborative creative works that emerged from nearly four decades of the Mountain Lake Workshop series. 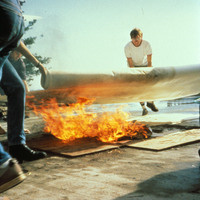 Founded by artist and scholar Ray Kass in 1980 and co-organized with influential art critic Dr. Donald B. Kuspit, Dr. Howard Risatti, and the Virginia Museum of Fine Arts (VMFA), The Mountain Lake Workshops integrated the arts and sciences in a dynamic experimental creative process that pushed past the traditional boundaries of art, dance, performance, and theater. Key artists include Cy Twombly (1928-2011); Wayne Thiebaud; folk-artist, Howard Finster (1918-2001); Japanese minimalist artist and sculptor, Jiro Okura (1943-2014); experimental composer, artist, author and composer, John Cage (1912-1992); East Harlem street artist and muralist, James De La Vega; Colorado based eco-artist, Lynn Hull; installation-artist, Mierle Laderman Ukeles (official artist in residence of the New York Sanitation Dept. ); ceramic artist, poet, and author of Centering, Mary C. Richards (1916-1999); sculptor in light forms and virtual reality, Jackie Matisse; artist, author and Zen Buddhist art scholar, Stephen Addiss; dancer and choreographer, Merce Cunningham (1919-2009;, Virginia photographer Sally Mann, with painter Jessie Mann and laser-artist Liz Liguori, among others, including Kass himself, whose individual workshops have provided an interface between the concepts and specific creative activities of many of the various workshops. This exhibition is organized by the Longwood Center for the Visual Arts at Longwood University and is funded in part by the National Endowment for the Arts.